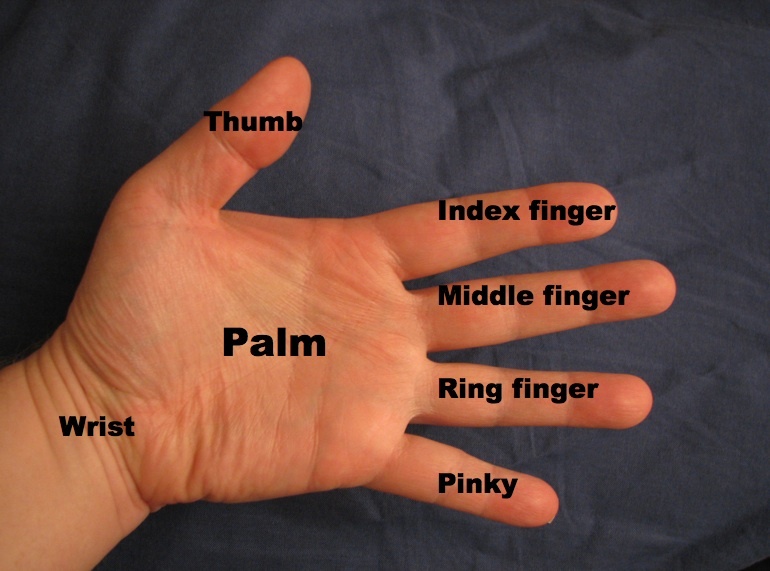 Common names for fingers of the hand. To my mind the human hand is a real marker of humanity. Alongside the anatomy of the foot, the human hand is especially designed for certain actions. Whereas the foot has changed to accommodate long distance bipedal walking, the human hand has developed to be extremely sensitive with dexterous movement. The mammalian order of the primates are the only animals with true hands, with humans, chimps and apes having two opposable thumbs and great gripping potential (Jurmain et al 2010). As the modified end to the ancestral fish fin, the human hand has retained the 5 original number of digits whilst a variety of animals have gone through reduction and modification in the number of their digits (e.g. horses, bats, pigs) (White & Folkens 2005: 225). The sense of touch is anchored in and from the hand. As ever careful excavation of the burial should take place when necessary. The small bones located in the human hand can be hard to spot, especially distal phalanges as they tend to be very small (see diagram). It is likely that most of the metacarpals and the larger phalanges will probably survive, however to spot the carpals care is needed as these can often look like stones. It can be very difficult to imagine how the bones would look in articulation during excavation, and as such all material should be saved for closer inspection rather then losing valuable information (Larsen 1997). A key note is to know that the hand bones will often be spread over a wider area, unlike the foot bones. On excavation in the summer of 2011 in Germany I realised firsthand how spread out they could be, with the phalanges of one supine burial found next to the leg bones, spread over the hip, with some lingering inside the chest cavity; the bones were all over! Overall there are 27 bones present in the hand. The bones in the hand are typically classed into three groups; the Carpals, Metacarpals & the Proximal, Intermediate & Distal Phalanges. The thumb is often called the Pollex, whilst each finger is usually referred to as a ray, starting on the index finger. As discussed previously, the carpals articulate with the distal ends of the ulna & radius (White & Folkens 2005). 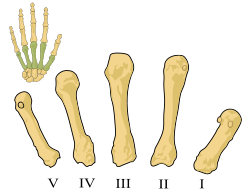 Classification of the bones in the human hand. It is an interesting fact that most of the bones in the human body come from the hands and the feet, as such have both a large number of phalanges. As outlined above, and discussed below, the carpals contain 8 bones, the metacarpals 5 bones, the proximal phalanges 5 bones, the intermediate 4 bones & the distal phalanges 5 bones. The hand is used for both gross motor skills and fine motor skills with the fingertips containing some of the densest bundles of nerves (Wikipedia 2011). Interesting the hand can reach almost anywhere on the persons body, discounting a small patch on the back and the elbow and lower arm the hand is located on. Name of each individual element, and the anatomical position in comparison with X -Ray of a human hand. The carpals make up the wrist, and are positioned as two tiers of four bones. Each of the bones have a characteristic shape, and recognizing the shapes in diagnosis of the separate carpal bones. The first proximal row consists of (from right to left in a right hand) the Scaphoid, Lunate, Triquetral & the Pisiform bones. The second distal row consists of the Trapezium, Trapezoid, Capitate and the Hamate bones (White & Folken 2005: 288-233). I advise you to click on the wikipedia links to see each element by itself, as it would take too much space up here! Scaphoid– The scaphoid bone is shaped like a boat, and is one of the largest carpal bones. It is the most lateral and proximal carpal bones, with a both a major concave and convex surface for the articulation, with the head of the hamate and the articulation surface of the distal radius. Lunate– The lunate takes the form of a crescent moon. Its deeply concave surface articulates with the capitate, whilst articular point opposite shares the distal radius with the scaphoid surface. Triquetral-The triquetral is the third bone in the carpal row and its main distinguishing feature is the three articular surfaces. Pisiform– The pisiform is a pea shaped bone and the smallest of the carpal bones. It actually develops inside a tendon, and as such does not articulate with any other bone directly. Trapezium– The trapezium is an irregularly shaped bone of medium size and is most distinguished by the largest facet and saddle shaped articular surface for the base of the first metacarpal. Trapezoid– The trapezoid bone is boot shaped, and it is the smallest bone in the distal row. It articulates distally with the second metacarpal (White & Folkens 2005: 231). Capitate– The capitate is a larger carpal bone that articulates distally with the metacarpal 3, 2 and sometimes 4. The end is squared off whilst the proximal end is rounded. Hamate– The hamate is the carpal bone which has the hook shaped non articular projection called the hamulus. This is a key aid in the diagnosing the hamate carpal. The hamulus is the fourth attachment point for the flexor retinaculum. The metacarpals are numbered from MC1 (thumb) to MC 5 (little finger). As White & Folkens discuss (2005: 233), the metacarpals are all tubular bones with rounded distal articular heads with the more rectangular proximal ends. As such they are most easily identified and sided by the morphology of the bases. Metacarpals of the human hand in articulation, where 1 represents the pollux. Metacarpal I: The first metacarpal is the shortest, broadest & more robust of the five. The singular proximal articular surface is saddle shape which corresponds to the fact on the trapezium (White & Folkens 2005: 236 & here after for the metacarpal section). Metacarpal II: The second metacarpal is normally the longest of the five with the base presenting as along curved blade like wedge. Metacarpal III: The third metacarpal lies at the base of the middle finger and it is the only metacarpal that has a sharp projection, called the styloid process, at its distal base. Metacarpal IV: The fourth metacarpal is shorter and more gracile then the MC 2 or MC 3 with a fairly square base with 3 or 4 articulating facets. 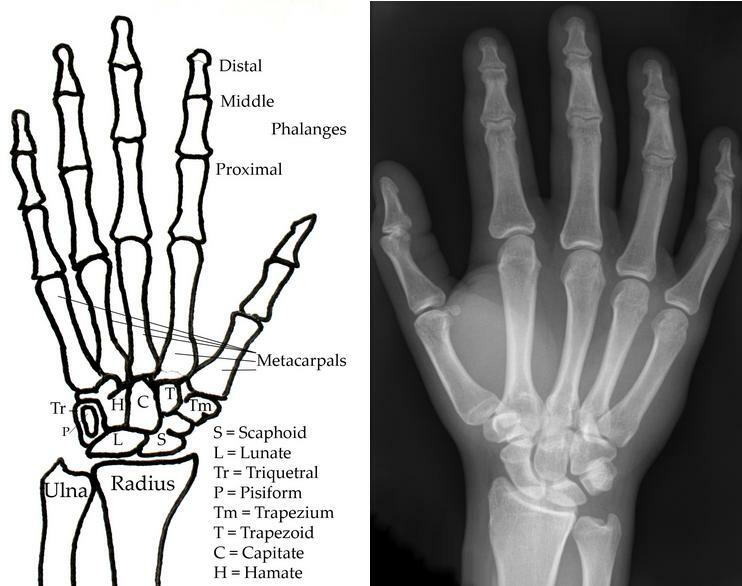 Metacarpal V: The fifth metacarpal is the thinnest and shortest of the non-pollical metacarpals (ie first or MC 1 rays). As a reference for siding either in the lab or on site I highly recommend White & Folkens 2005, this blog entry can be only just a short guide. The phalanges consist of the last three digit of each finger (only two for the thumb). They are all shorter then the metacarpals and tend to be somewhat flattened as well. The thumb phalanges are shorter and thicker then the other rays, whilst it also lacks a intermediate phalanx. Proximal, intermediate and distal phalanges (MMG 2004). Proximal Phalanges: Each of the proximal phalanges has a concave proximal articular facet for the metacarpal head. The thumb proximal phalanges is easily recognizable for its stout and squat appearance. 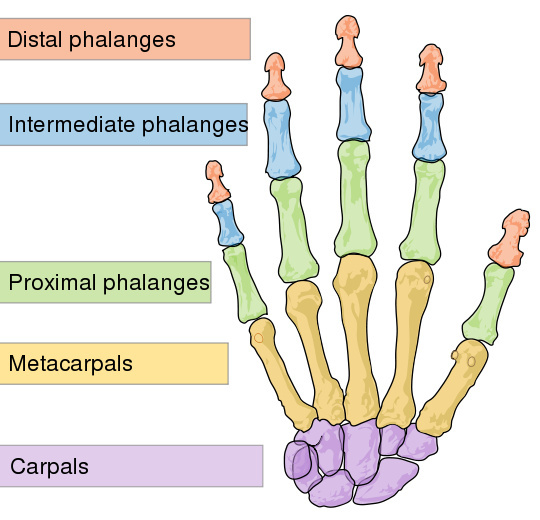 Intermediate Phalanges: Following the proximal phalanges is the intermediate phalanges which has a double articular proximal facet for the head of the proximal phalanx, whilst each also has a distal articular facet. 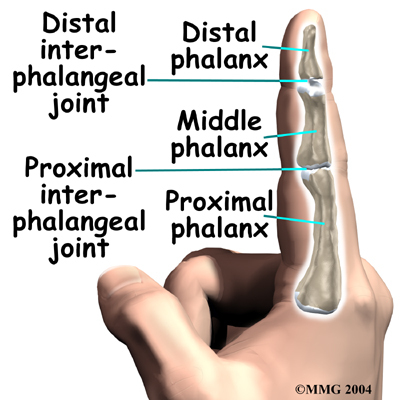 Distal Phalange: Each of the distal phalanges has a double proximal articular facet for the intermediate phalanx. The end of these phalanges terminate in the distal phalangeal tuberosity, which is a key indicator that you’ve found a pinky! As above, please note my main source is White & Folkens (2005) Human Bone Manual. As mentioned above in the beginning of this entry, I noticed first hand in Germany on placement whilst excavating in a medieval cemetery of how dispersed the carpals, metacarpals & phalanges can be in a grave context, especially in a supine burial context. Due to the nature of the position of the body during burial and the subsequent flesh decomposition and natural earth movements, the delicate bones of the hand can often move around. Care really is needed to recover each of the bones that survive. I include below a photograph I took at the Domersleben medieval cemetery excavation in the summer of 2011 to present how the hand bones had moved around and displaced since internment of the body. 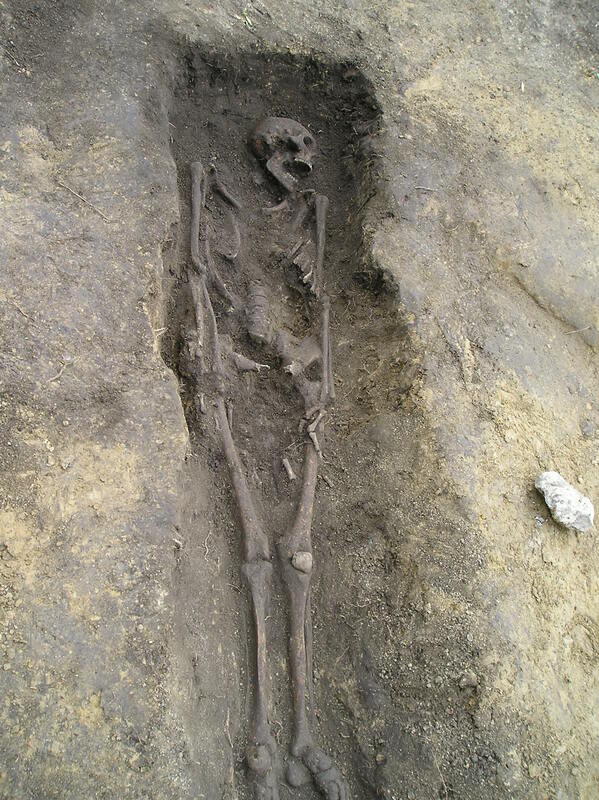 Note the position of the metacarpals and phalanges in this Medieval cemetery burial. The recovering of the hand bones depends on the burial context (supine, extended or flexed burial, whether cremation was carried out etc), and of careful excavation around the areas where you expect the recovery of hand bones themselves (Larsen 1997). Although the carpals can be hard to identify and to side, it is well well worth spending a good few days with a reference sample to make sure you understand the basic anatomy and main skeletal landmarks of the individual elements. The evolution of the human hand has been critical to the way Homo sapiens both express themselves and how they interact with the environment. Without the incredible grasping powers of the pollex, it is unlikely Homo sapiens and other later hominids would have been able to create such intricately carved lithics or artworks such the Upper Palaeolithic cave site of Lascaux in modern day France (Jurmain et al. 2011). A fun and interesting website on Hand Facts!